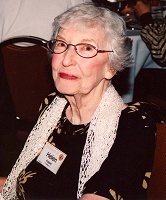 Helen Kupper was born in late 1917 in Chicago. She married, had two daughters, and was widowed at an early age. Subsequent to that, she joined Mensa so that she could meet new people. That was 40 years ago this month. During those forty years, Helen contributed much to our organization, serving on every level from local to international. She co-chaired the US Annual Gathering in 1974, then went on to run our first four HalloweeMs, all while serving on our board as a General Representative or Local Secretary. She went on to become Regional Vice Chairman for our region, then was Director of Development for Mensa International. For all the great work she did, she was given awards at every level, including Chicago Mensa's long-term service award, the Margot award from American Mensa, and the Distinguished Service award from Mensa International. After she retired from international service, Helen became Area Coördinator for Chicago, a position she held until just a few months before her death. She was also involved in the newsletter end of Chicago Mensa, serving as proofreader, activities bulletin editor, and publications officer at various times, plus she served as NomComm and Awards Chair when asked. In addition to all the official jobs, she hosted or co-hosted the Poetry SIG for many years, plus her annual Anti-Doldrums party was held every spring for 35 years and enjoyed by many. A lover of art, she also co-hosted ALBAMS with her long-time companion, Jay Smith. Helen loved games and was one of the best charades and Boggle players in Mensa, playing long into the night at the Monthly Gatherings (aka Meetings) for many years. She was always one of the Revered Judges at the Fiendish Armchair Treasure Hunts held at HalloweeM and at RGs across the Midwest. Helen had a ready smile and was always there to lend a helping hand whenever and wherever it was needed. She was very outgoing and friendly and made many friends everywhere. I had the pleasure of giving her a surprise party for her 80th birthday, and 75 friends from six states came in for the occasion--and we actually managed to surprise her when everyone kept the secret. She thought she was going to a local Mensa meeting, and she told me later that when she opened the door and saw there were all these people in the room standing quietly with the lights off, she thought she'd wandered into a seance, at least until the lights went on and everyone yelled, "Surprise!" Helen touched so many people and was an integral part of our group for so long, that her absence is keenly felt now that she's gone. I personally miss her every day. HelenKupper.php last updated January 27, 2019.